Might as well take the opportunity to update the blog with some other new stuff when I have access to a computer with internet, and have the time. I feel sorry that you have to wait weeks for a response to your emails. I'm on to it but last week(s) I have just given up everything. 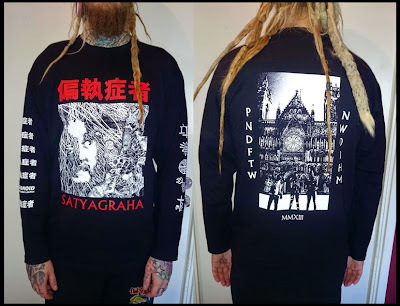 The longsleeves that we printed last time ran out in a day or two so we decided to make a new edition with the "Satyagraha" LP front cover made by Andy/Viral Age. UPDATE (25/5), IN STOCK NOW. Available sizes: S, M, L, XL, XXL. Price: 225sek + postage. Send all orders to the email below. 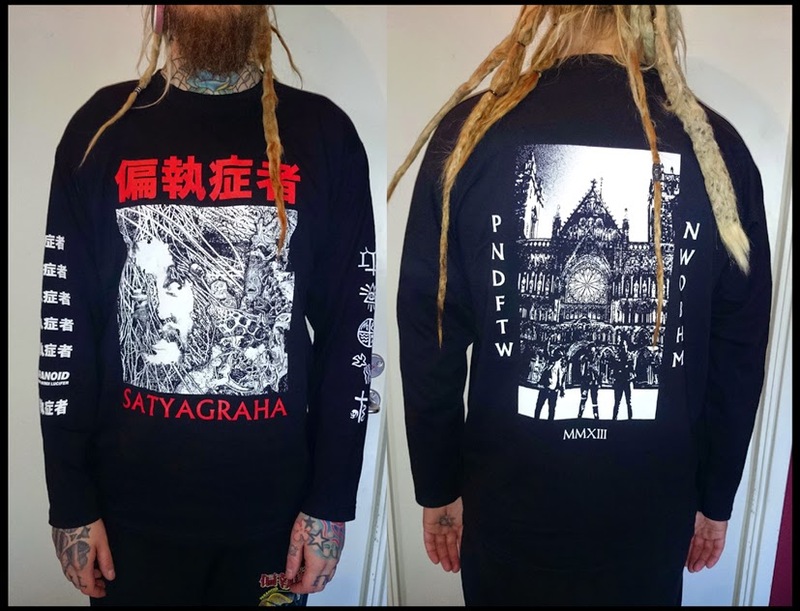 Our great friend at Konton Crasher will release th US version of "Satyagraha". Get in touch with either us or K.C. for w/s. "What's the deal with that Destroy future... re-issue?". It's very simple, the 7" on Konton Crasher was released over a year ago and was sold out in no time. There are many who still ask for it when we're out playing and now we make it available again. When we recorded that 7" we also recorded three other tracks that ended up on the "Distortion Faith #1" compilation cassette. Which is sold out too, so we decided to put the entire 7" in full on Side A and the three comp tracks on Side B. Voila, Mini LP (european press) completed. 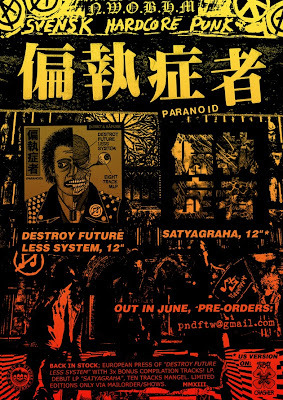 偏執症者 (Paranoid) - "Satyagraha" + "Destroy future less system" (European version), LP. Test pressings approved! 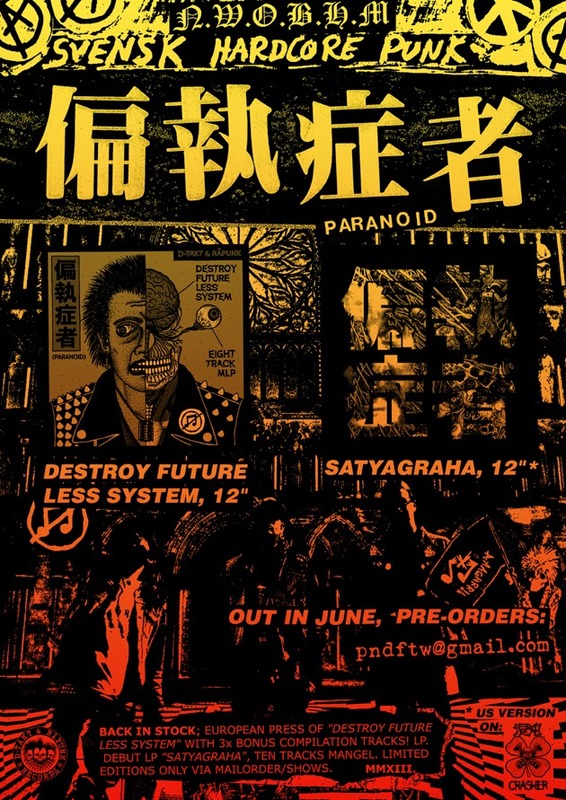 Here, at PUNK-RADIO, you have an exclusive pre-listening to a track by 偏執症者 taken from the upcoming split w/ ABSOLUT. For further info get in touch with the labels; Beach Impediment / Brain Solvent Propaganda (US press), Phobia / Crucificados (Eur. press). Release date: Summer 2015. Great mixing/mastering by Kenko at Communichaos, and brilliant art by Sugi! "Bloodthirsty System" was the very first song I ever heard with State of Fear, it must have been around 97-98. Like any other teenager at the age of 17 I spent every weekend with my best friends and a couple of six-packs. Listening to punk and out raising hell. My youth is kind of blurred. Haha. But as far as I can remember I was at a party that the guitarist in one of my old bands had. The song struck me like a lightning and we listened to it on repeat the entire night. Directly on the Monday after I called Dolores (Distortion Records) and ordered myself a copy of "Wallow In Squalor EP " and I added the "The tables will turn..." LP on the advice of the one who received my order. Which is also a damn great album, but that's another story. And yes...you read that right, called, as in dialing a number and place an order to a real person on the other side of the line. I can still today get that feeling of my first love for the band, and although I've heard "Bloodthirsty System" thousands of times the genuine and the simplicity of the song never fade. The song itself has a pretty thin but very honest and raw production. What I think that I like the most is the wild drum style, and of course the intense dual vocals which usually is the common denominator between most crust bands. Jay is a chapter for itself, and then we have Jon, and voila, we have the perfect combination of pure frustration, integrity and sensible political views. Even though the lyric of this song was written 20 years ago it's even more relevant today. It's embarrassing. The consumer society of today will become mankind's grave. It's no longer a question of "Buy or die", but instead buy And die. I have always wanted to play cover on this song with my other/old bands, but it was only now that I really got the chance to fulfill my wishes. I would say that State of Fear is punk at its best! There is something special with their riffs, same thing goes for Consume and Deathraid. I can't put my finger on what it is, they just have IT. In 2010 Deathraid played at LÓrient in Linköping, Sweden, and I took the courage to me and asked Jay about the secret behind the riffs. "I have stolen everything from the Mob 47", was the only answer I got. End of conversation. While we're talking about Consume, I could also mention that I suggested that we should record "2nd Class Citizen" as a cover of the month. But it was either State of Fear or Consume, a hard but really not that difficult choice. Brilliant band/song though. If you haven't heard or listened to Consume earlier I can highly recommend the split they did with Born/Dead. Trve quality from beginning to end. A song that, however, we tried to rehearse was "Just think about it" by Extreme Noise Terror. And E.N.T was really high on our list of bands doing cover on. I mean, who hasn't ripped it up to "Phonophobia"?! Unfortunately we have only 12 bands and 12 songs to do and the list of songs we want to do is a hundred times longer than months that we have left on this project. At least we gave it a try, but it didn't really sound like we wanted. Again, both State of Fear and Extreme Noise Terror were great inspirations for me when I started my own first käng-bands in the nineties. But they were not the only ones, I think it's important to also mention Doom and Disrupt if we are talking about käng/crust bands. That's why it feels especially exciting that it is Bri Doom who has mixed this cover song. He knows the drill when it comes to this sub-genre of punk and it's always fun and rewarding with new cooperation. After a very short discussion suggested Bri that we would donate money to the "CHILE DONATION" instead of paying him for the mixing. A really good suggestion that we think more people should do! Read all about the background story and how you can help and contribute on DOOM's website (click the link). Worth mentioning, redundant information but still, is that Emil (drummer) make his vocal debut in Paranoid on the choruses. He barely made it through all three choruses before his voice was completely fucked. Well, it's tough getting old. I'll tell you that much.